The period between 1970 and 2010 has witnessed one of the largest mass migrations in modern history—the net movement of more than 10 million Mexicans from Mexico into the United States. In 1970, there were fewer than one million Mexican immigrants living in the U.S. By 2000, that number had grown to 9.8 million and by 2007 it reached 12.5 million. 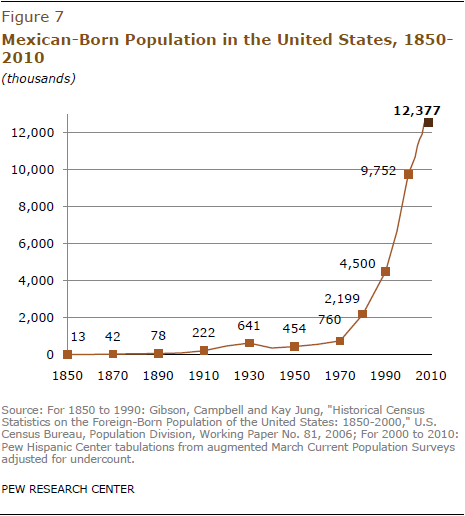 Since then, the Mexican-born population has remained roughly constant. Many Mexican immigrants are in the U.S. without authorization. In 2010 some 6.5 million—more than half (52%) of all Mexican immigrants—were unauthorized immigrants. Among the nation’s 11.2 million unauthorized immigrants from all parts of the world, the majority (58%) are from Mexico (Passel and Cohn, 2011). Many of these unauthorized immigrants have had children in the U.S. Between March 2009 and March 2010, 68% of the 350,000 U.S. births to unauthorized immigrant parents were to Mexican unauthorized immigrants. Mexican migration to the U.S. has long been characterized, at least in part, by a circular pattern. While many Mexican migrants enter the U.S. to settle permanently, a significant number come to the U.S. to work for a short time, often in seasonal jobs, and return to Mexico. According to a Pew Hispanic Center analysis of Mexican government data, there appears to be less of this return migration now than in the past, possibly because of the increased financial costs of migrating back to the U.S. and the increased danger of crossing the U.S.-Mexico border. In 2006 and 2007, more than 450,000 Mexican migrants returned from the U.S. to Mexico each year. Since then, the number of Mexicans returning to Mexico annually from the U.S. has declined, to 319,000 in 2010.